Comfrey is a time-honored herb with amazing abilities as a traditional topical medicine, and it's even easy to grow at home. Learn more about its full potential here. One of the original herbal remedies of classical civilizations, comfrey has long been considered both a powerful healing agent and an ornamental beauty. A native to the temperate marshy regions of Europe and Western Asia, comfrey has since been naturalized to similar climates worldwide. It now thrives in North America and Australia with the same strength. Although modern research has altered its uses over the years, today it is still used widely in alternative medicine around the world. Treating fractures. Comfrey is considered effective for healing broken bones. Lowering inflammation. Comfrey helps relieve the pain and swelling of bruises and sprains. It has also been shown to be effective reducing the symptoms of osteoarthritis. Comfrey's primary active compound is allantoin. Allantoin is a very potent cell-growth stimulator and after being applied triggers near-immediate cell proliferation. increases the water content of the body's organ tissues and stimulates the peeling of the upper layers of dead cells. Comfrey's rosmarinic acid content also has anti-inflammatory properties and helps treat inflammations. The herb also has high concentrations of phenolic acids - notably rosmarinic acid. Other herbs with wound healing and anti-inflammatory properties are gotu kola and horse chestnut. 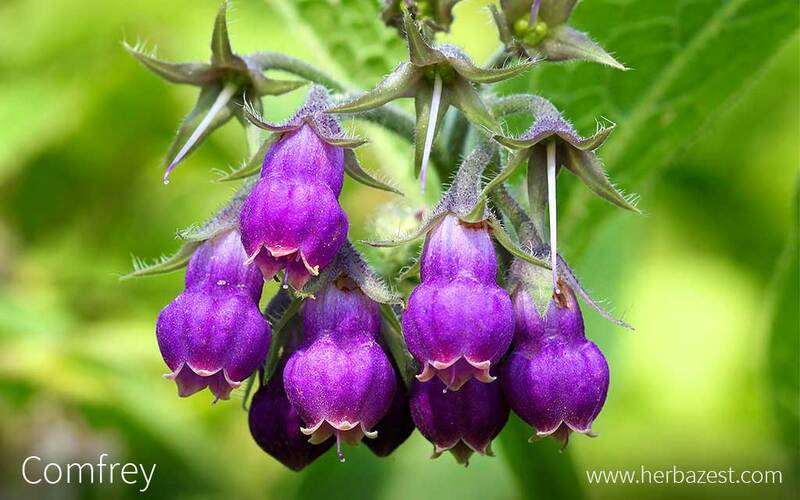 Comfrey contains highly toxic pyrrolizidine alkaloids, which is why its oral use is unsafe. However, it is still considered relatively safe for topical use when care is taken. In addition, its use in supplements and other ingested products is discouraged worldwide and has been banned in both the U.S. and Canada. Comfrey should not be given to children or applied to open wounds or broken skin. It should not be used for more than 10 consecutive days, and more no more than four to six weeks out of the year. Due to its potential toxicity when orally ingested, comfrey is exclusively used topically. The leaves and roots are be made into herbal preparations. Poultice. A poultice can be made from one part dried root mashed into 10 parts water. It can be applied to bruises, boils, and closed wounds with a strip of gauze on top. Ointment. Comfrey ointment is typically made from infused oil of comfrey leaves mixed with beeswax. It is spread on bruises. Experts warn to make sure broken bones are set before applying comfrey salve, as bonding will begin almost immediately. Liquid extract. Product of a distillation process, comfrey extracts can be applied to minor closed wounds and acne. The dried roots and leaves of comfrey are more seasonally available during autumn. Topical comfrey preparations - namely ointments and liquid extracts - are available from specialized health stores and online herb stores. A hardy and sturdy perennial, comfrey is a garden favorite for many due to its pleasing, bright flowers and full shape. It can withstand temperatures as low as -40°F (-40°C), though more temperate climates are ideal. Deep, fertile soil is best to support its extensive root system - which absorbs large quantities of nutrients - and weeding will help propagation. Like many ornamental plants, it prefers full sunlight but will tolerate partial shade. Comfrey is more commonly grown from root cuttings four to six inches (10 - 15 cm) in length, planted horizontally three inches (7.5 cm) deep and three inches apart. Once established, it does not require extensive care, and it is seldom attacked by pests or diseases. Growing up to three feet (1 m) tall, its thick leaves and bell-like flowers are arranged on erect stalks that grow together in clusters. Blooms can range in color from white to pink to a deeper mauve, and the dense root system is sometimes harvested for medicinal use. A member of the Boraginaceae, or forget-me-not family, comfrey is classed with 2,000 other species of flowering shrubs, trees, and herbs, most notably borage (Borago officinalis). Symphytum officinale is divided into two distinct subspecies, S. officinale officinale and S. officinale uliginosum. The first subspecies has two main varieties: S. officinale officinale var. variegatum, which can be recognized by its leaves with white margins, and S. officinale officinale var. bocking, a sterile hybrid that doesn't self-seed. In addition, the seven other members of its genus also use the term as part of their nonscientific names. They are primarily differentiated based on physical characteristics like size and texture: S. ibericum, or dwarf comfrey, is the smallest variety, while S. asperum, or rough comfrey, has notably prickly foliage. Symphytum x uplandicum, or Russian comfrey, is actually a hybrid species that is a cross between S. officinale and S. asperum. The first empirical evidence of human use of comfrey dates back roughly 2,500 years to the herbalists of ancient Greece and Rome. Through the Middle Ages, comfrey was deemed to be effective in treating everything from stomach ulcers to bronchitis, and Catholic monks frequently grew it in their gardens. The herb was brought to England for ornamental use at the turn of the 17th century, from where it traveled to different British Imperial colonies and territories before spreading across the world. Because recent research has suggested that comfrey should not be ingested, the importance of comfrey as a commercial crop has greatly diminished in recent years. Among certain areas of its largest markets, most notably Canada, the sale of all comfrey supplements and topical preparations was banned altogether, producing a significant toll on the industry. However, the plant remains popular as an ornamental plant and is greatly demanded in England for this purpose. Salves and other skin ointments that feature the herb, however, are still regarded as safe by a significant number of herbalists for treating osteoarthritis, a condition affecting more than 20 million people in the U.S. alone. In the Christian tradition, some believe comfrey to be one of the patriarchal herbs, present in the Garden of Eden alongside the first of humankind. Comfrey is viewed as aesthetically beautiful for its shape and colorful blooms in many parts of the world, and thus it is commonly used as an ornamental plant in gardens. It is also sometimes used as animal fodder, as it appears not to affect livestock in the same way as humans. Reportedly beneficial for diminishing scars and varicose veins, some beauty products also feature the herb as an ingredient.